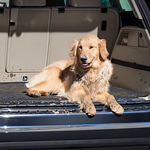 If you’ve ever driven with a pet in your car, especially a dog, you know how quickly your car can be filled with dog hair. At Valley Imports Mitsubishi, we want to help you become informed vehicle owners knowledgeable on how to keep your car free of dog hair and not allow it to ruin your car. Prior to taking your dog on a trip, brush him thoroughly. Lay a sheet or protective covering over the seat. When the dog leaves the car, all you need to do is remove the sheet. If there is hair on the seats, spray some water or a mixture of water and fabric softener. Wipe the seats down with a rubber glove or paper towel. Give us a call or stop and see us at our Mitsubishi showroom and let us show you our supply of automotive supplies and give you tips on easily removing pet hair from your vehicle.